Bath is a city in the county of Somerset in England. 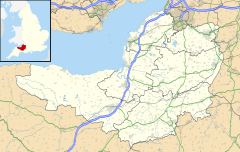 It is 97 miles (156 km) west of London and 13 miles (21 km) southeast of Bristol. Bath is a UNESCO World Heritage Site. The city has preserved some of its Roman remains and its 18th century architecture. The city gets its name from the famous Roman baths in the town. The Romans built the baths as part of a spa, in the year 43 BC. They called it Aquae Sulis, which means "The waters of Sulis". Sulis was a local goddess. During the Middle Ages, it was an important city for buying and selling wool. Bath became a city in 1585, when Queen Elizabeth I declared it to be one. Bath is where Roald Dahl's short story "The Landlady" takes place. The city is also mentioned in many of Jane Austen's books, like Northanger Abbey, Sense and Sensibility, and Pride and Prejudice. Pulteney Bridge in Bath, designed by Robert Adam. It is one of only four bridges in the world to have shops on both sides. ↑ 2.0 2.1 2.2 UNESCO, "City of Bath"; retrieved 2012-4-19. This page was last changed on 22 February 2019, at 14:21.